Having seen what happened to the last group of metahumans who faced Mr. Nobody on behalf of Dr. Niles Caulder, the residents of Doom Manor find themselves beset by uncomfortable images from their past. This leads to one weird morning, even by the standards of Doom Manor. This, in turn, leads Cliff “Robotman” Steele to suggest a radical idea. They know that Mr. Nobody can somehow draw upon a person’s darkest secrets and repressed baggage to mess them up on a psychic and spiritual level. What if they destroy that baggage by opening up to each other, vent their spleens on everything that is bothering them and rob their apparent arch-enemy of that ammunition? Group Therapy. Yes, it has come to this. If they had a qualified therapist, it might work. As it is, they don’t even have Jerry Springer. All they have is an increasingly manic robot-man shouting at people to open up and reveal everything they’ve been holding back from the world and themselves for decades. Most people are familiar with the Rashamon Effect even if they aren’t familiar with the technical term. Named after the classic 1950 Akira Kurosawa movie Rashamon, it refers to when the same story is told from multiple viewpoints in a work of fiction. It’s also used to describe how people will remember the same event differently based on their perceptions. “Therapy Patrol” opens up with one heck of a Rashamon sequence, as we see our cast waking up and preparing for a team meeting. This leads to a bending of perceptions, which may or may not be Mr. Nobody’s fault. These individual sequences are all brilliantly acted and give each member of the ensemble a chance to shine, from Cyborg’s ultimately depressing attempts to make a connection through a dating app to Cliff Steele’s anger at finding out (through Facebook) his daughter was raised by the same member of his pit crew who had an affair with his wife and that she considers him her daddy. Whatever else can be said about “Therapy Patrol”, it opens up the characters in new ways that should prove interesting in the future. The only real problem, if it can be called that, is that the show doesn’t seem to be addressing the issue of the missing Dr. Niles Caulder and his being rescued anytime soon. Indeed, the preview for next week’s episode reveals that we’re soon going to be introduced to Danny the Street. Thankfully, if you’re the sort of person who liked the original Doom Patrol comics, or appreciates lunacy for the sake of lunacy, this meandering towards a plot will prove quite amusing. 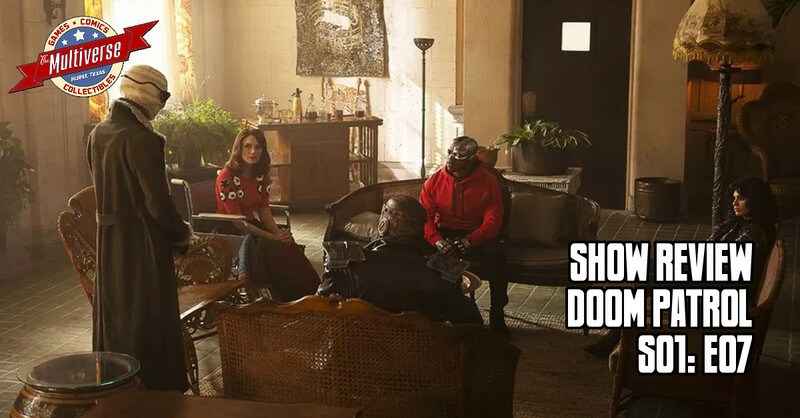 Doom Patrol – Episode 7, “Therapy Patrol”, airs Friday, March 29, on DC Universe.